And when I say "not in the way," I mean DON'T read it directly after reading (another novel I recently reviewed) A Dog's Purpose. In fact, now that I've made the mistake (and I'll explain in a bit), if you haven't read either of these two books yet, I recommend reading The Art of Racing in the Rain first. A brief explanation: Both books are narrated by a dog. Both books deal with difficult situations (both human and canine). Both books celebrate and study the bond between dogs and humans. Both books are engaging and evocative. However: The authors use largely different writing styles. The dog protagonists have completely different intellects, personalities, mannerisms and "philosophies." One book (A Dog's Purpose) is suitable for (older) children, the other (due to language and adult situations) is not. But since I read them practically back-to-back, I can't stop comparing the two, even though in doing so I'm comparing (pardon the cliche) apples to oranges. So. Let me just say this: I plowed through The Art of Racing in the Rain in just a few hours (over two days). It was that engaging. It is a good read. Just know that Enzo, the narrator, is not overtly dog-like. In fact, he is so human-like (in his thinking), at times, you might forget he's a dog at all. This was one of my favorite books, I may need to read it again this summer :) I also have A Dog's Purpose, but I haven't had a chance to read it yet . . next on my list! I've gave this book to everyone I know the first year it came out. I re-read it at least once a year. Not just a great dog book, but a great book. Have to admit, I haven't read either yet - so thank you, I will heed your advice! Hubby has read The Art of Racing in the Rain and I'm not sure I'm up to tackling it. I do plan to get around to it, but I'm not a fan of sad endings. Mama read "A Dog's Purpose" to me, and my eyes no would stop leaking, and Mama says she has a worry to read any more dog-narrated books! She has so many sensitives, geez.... I, of course, just had leaky eyes. Allergies probably. 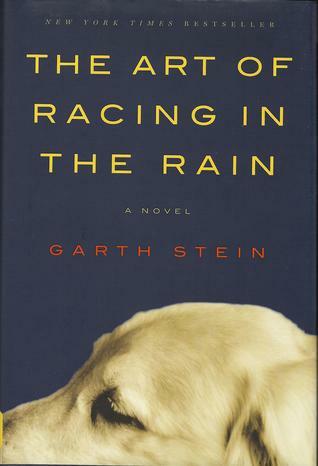 My mom read Art of Racing in the Rain and then gave it to me. I read it last summer. I agree that Enzo's voice isn't all that dog-like sometimes, but it is a very quick and easy read. So *that's* what I did wrong!? I had finished reading "A Dog's Purpose" and was looking for something else to read when I came across "The Art of..." And I just couldn't get into it. I will try again now that it's been a year or so. Thanks for the tip. I have always avoided books that speak from the dog's perspective; however, this seems to be getting the general seal of approval, so I'll have to check it out.